They've performed at Disney World in Florida and marched in New York's City's Columbus Day Parade. Now the FREE Players Drum Corps is setting its sights on a trip to the 2018 world championships in Indianapolis. But what sets this group of flag wavers, rifle twirlers, drummers and other musicians apart is that it is composed entirely of adults with intellectual and physical disabilities. The 65-member corps, based in the Long Island suburbs, was founded in 2010 by a music specialist at Family Residences and Essential Enterprises Inc., a New York organization that serves 4,000 people with intellectual and developmental disabilities, mental illnesses or traumatic brain injuries - and that gives the corps its name. Today it includes a drum line, color guard, and an ensemble of guitars, keyboards and other instruments. A brass and woodwind section is being added this year. 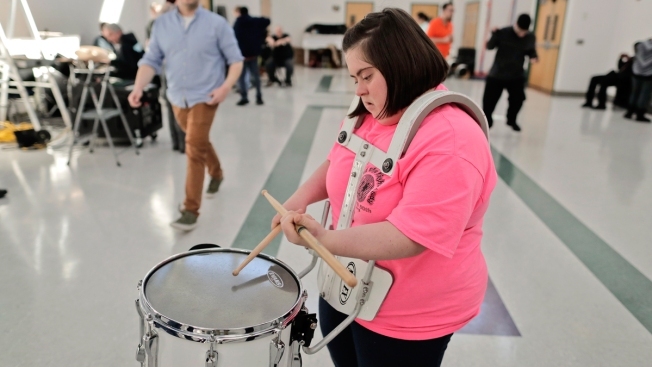 Band members have mild to moderate disabilities, including some on the autism spectrum. Some are vision-impaired. Others perform in wheelchairs. "This group is like my family," said 33-year-old drummer and corps member Michael Brennan, who has Down syndrome and a seizure disorder. "I feel very honored and proud because I finally can open up and tell people, that I'm me, I'm unique. When I'm playing my snare drum, they see how much success I'm getting." At a recent rehearsal, a cue from band founder Brian Calhoun sent drums thundering through a small gymnasium in Old Bethpage. Snare and bass drummers marched into several formations. A day earlier it had been the color guard's turn to practice, spinning brightly colored pink flags, while others in formation maneuvered faux rifles. A former drummer in a rock band, Calhoun started with just five students learning the rudiments of drumming on rubber pads. "I'm kind of a flashy player, and they really liked the stick tricks," he said of his first recruits, who were receptive and enthusiastic learners. "They were picking up on difficult things." Five members turned to 15 within a year. A year or two later, an expanding number of drummers was supplemented by a color guard. By 2013, the corps received an invitation to play at Disney World. A year later, it performed an exhibition before more than 10,000 people at a Winter Guard International event in Dayton, Ohio. "The response was unbelievable," Calhoun said. The exposure helped bring in sponsorship deals with drum companies and the acquisition of official uniforms, he said. After the FREE Players performed a 2015 exhibition in Allentown, Pennsylvania, the band received an invitation to perform an exhibition at the Drum Corps International world championships in 2018 in Indianapolis. "They were received so warmly by the audience that it just made sense," said Drum Corps International CEO Dan Acheson. "The one aspect that makes it special is just the joy they display when they perform." The trip to Indianapolis will cost the band $65,000, in part because it needs to bring along support and medical staff, including nurses, something a typical drum corps doesn't have to worry about, Calhoun said. A Go-Fund Me fund-raiser is underway to raise money for the trip. Kathleen Brennan gushed when speaking about the changes she has seen in her son Michael since he joined the drum corps several years ago. "He has tremendous confidence and has blossomed extremely well," she said. "They get it with these kids. The impact on my son's life has been amazing." Calhoun said his troupe of "differently abled" adults ranging from their 20s to their 50s has changed his life, too. He said he sometimes wipes away tears after hearing the crowds cheer at performances. "They're just like everybody else, that's the biggest thing. They're extremely passionate. They're the most honest, caring passionate musicians I've ever had the privilege to teach in my entire life," he said. "They take their instruments home and they practice day in and day out and they always strive to push themselves as far as they can possibly go."